To reinforce healthy eating concepts and practice locomotor and teamwork skills. Students will review the 5 food groups and use different locomotor skills to work with their team to prepare a "balanced" Thanksgiving meal. *"Placemat" (see below for picture) for students to prepare their meal by placing their food cards on the different sections. Remind students weï¿½ve been talking about eating healthy foods. Ask them, ï¿½what are the 5 food groups (link opens new window and takes you to Choose My Plate website) we should be eating foods from every day?ï¿½ Remind them that with Thanksgiving coming up, itï¿½s a great opportunity for them to try to eat some healthy foods (along with some delicious ï¿½sometimesï¿½ foods). Ask several students to name a favorite Thanksgiving food and then figure out as a group what food group it belongs to. --Teams will work together to create a ï¿½well-balancedï¿½ meal for Thanksgiving. Their meal needs at least one thing in each category to be ï¿½well-balancedï¿½, and it can even have 2 vegetables since thatï¿½s the biggest food group we should be eating. --Students will be broken up into teams of 4-6 kids. To make a meal, students take turns performing a locomotor move (indicated by my directions and the cone with a Locomotor Skills poster in the middle) one at a time from one side of the gym to the other. Once there, they pick a food (Thanksgiving food cards) from the hoop and bring it back to their teamï¿½s ï¿½placematï¿½. Students then send a new member to get another kind of food. ---Take one food at a time. ---You only need one from each category to build your well-balanced meal. ---Sit quietly with your team while the other teams finish. 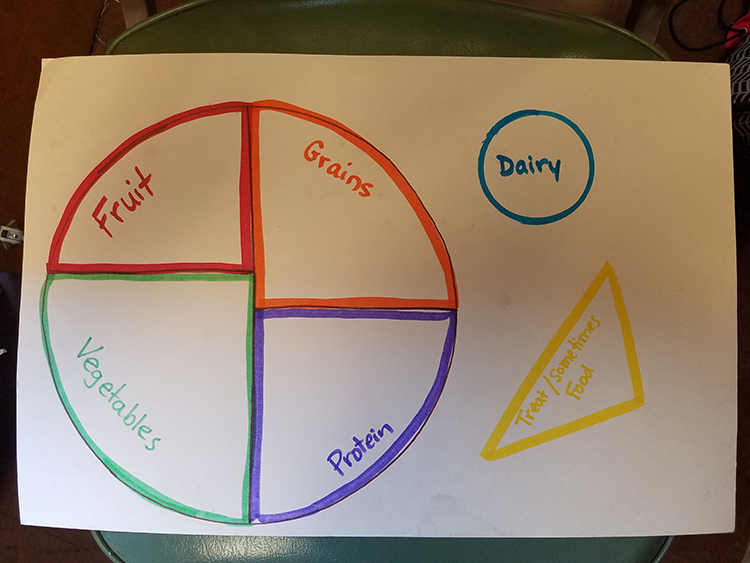 ---Share out- once all students have a meal, Iï¿½ll ask them to talk with their teams about what the foods on their plate are and which ones are their favorites. --If time, play again, challenging students to get different foods from each category to complete their meal. -Are students putting the foods in the correct category? -Are students performing the correct locomotor movement when instructed? -Use the colors to support understanding - tell them to get a food from the blue hoop, for example, rather than telling them to get a dairy. -Have students work with a typically-developed peer to help them do the movement and choose the food. -Allow students with disabilities to move however they choose across the gym floor. Submitted by Robin Largesse who teaches at North Grafton Elementary School in North Grafton, MA. Thanks for contributing to PE Central! Posted on PEC: 5/27/2018. Viewed 6688 times since 5/25/2018.